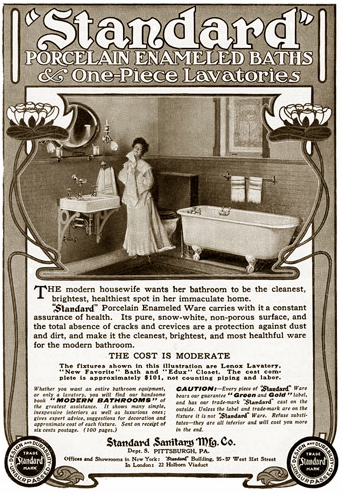 It wasn't until the early 1900's, that bathrooms started to be commonplace in American homes. And their addition to the home coincided with a new understanding about the need for cleanliness to reduce the spread of disease. Suddenly, people wanted a bathroom with easy to clean finishes. 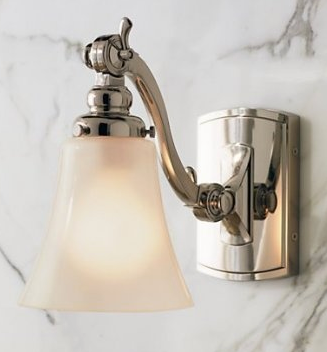 The Standard Sanitary Manufacturing Company capitalized on this and touted their bathroom fixtures as a 'Sanitary' solution for the home (and certainly a nice improvement over a chamber pot!). Started in 1875, they offered a line of toilets, tubs and sinks for the home. I had to laugh when I read the tagline in this ad - 'The modern housewife wants her bathroom to be the cleanest, brightest, healthiest spot in her immaculate home'! See that tub in the photo? We're lucky enough to have one in our bungalow. When we turned the tub over to paint it, we discovered it was embossed with the name of the company, a model number and date of manufacture. 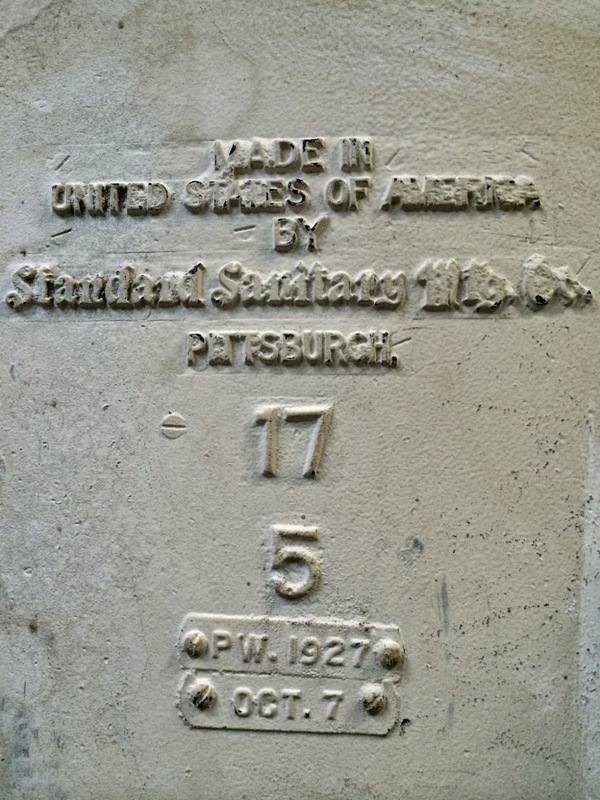 Our tub was made on October 7, 1927, in Pittsburgh, PA (and if you're curious, the company merged with the American Radiator Company in 1929 and ultimately became American Standard, a company we're all familiar with today!). Underside of our vintage tub! With all this in mind, I wanted to create a bathroom that harkens back to the Sanitary Bathroom design of the early 20th century. That means easy to clean finishes, white tile, and real (or reproduced) vintage fixtures. Of course the focal point will be our vintage tub. At the ripe old age of 87, it's in great shape. I had a tub expert come in and he recommended I clean it thoroughly and then use rubbing compound to bring the finish back to a glowing shine. 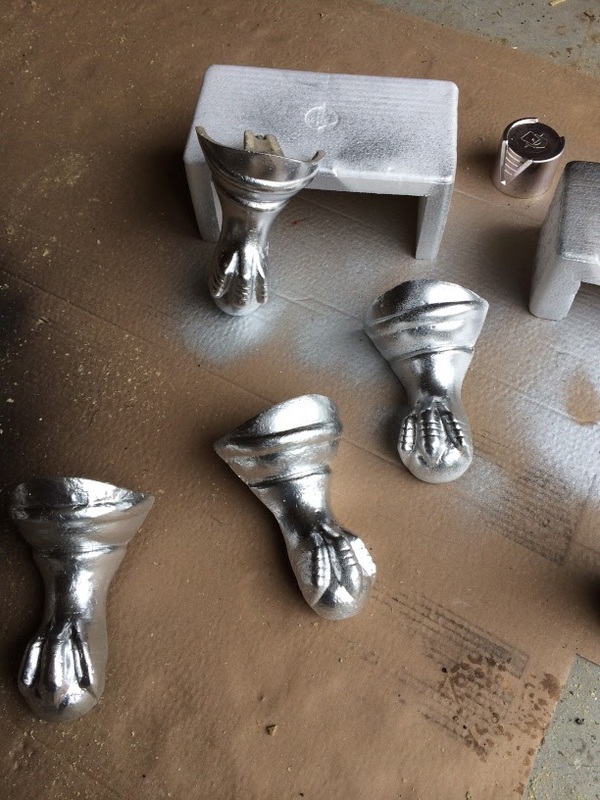 I cleaned up the claw and ball feet and finished them with a silver finish. The exterior of the tub will be painted Sassy Green- we need something to jazz up all the white tile I'll be using in the space. 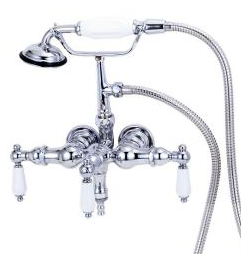 And we'll be adding a beautiful new faucet for more vintage charm. 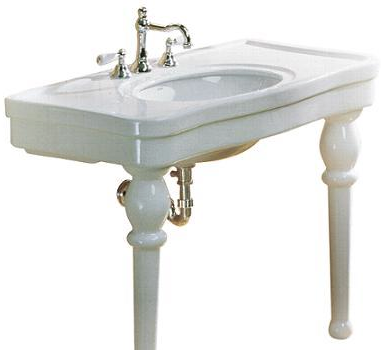 I found this beautiful reproduction sink to compliment the overall design. I love the style and it looks just like some that are featured in Standard Sanitary Manufacturing's early advertisements! A hallmark of Craftsman design is incorporation of stained glass. I'm going to tile the entire wall, floor to ceiling, behind the tub. 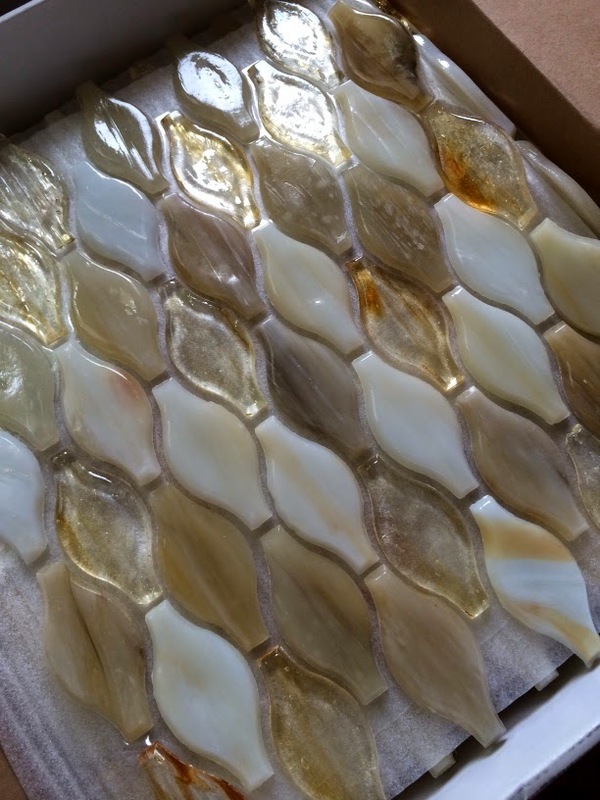 And I'll add a mock window above the tub, using this beautiful stained glass tile from Hirsch. It has beautiful Craftsman colors in it - green, amber and putty. And last, but not least, I have a vintage style medicine cabinet, which will be flanked by two Bistro light fixtures from Restoration Hardware. They can be adjusted to whatever angle you want, with the levers on the side. Such a nice feature! Now that we have the plan in place, I can't wait to get started pulling it all together! So cool! What the ad didn't say was that initially those who could afford indoor bathrooms with tubs and toilets probably also had a maid ;-) The turn of the century brought with it many new things that those who could afford them, did, and reveled in having the latest thing....not unlike how we are today wanting the latest ipad, flatscreen TV or other household gadget ;-) I'd love to have that tub BTW. Once staying at a B&B I got the opportunity to bathe in a reproduction one (fiberglass..they weren't going to crate a cast iron one up to the third floor!). It was heavenly! Can't wait to see your completed bathroom. That's a great point Connie. They tout it as $101 for the complete suite, but that was a LOT of money in those days! But we all want the latest luxuries! 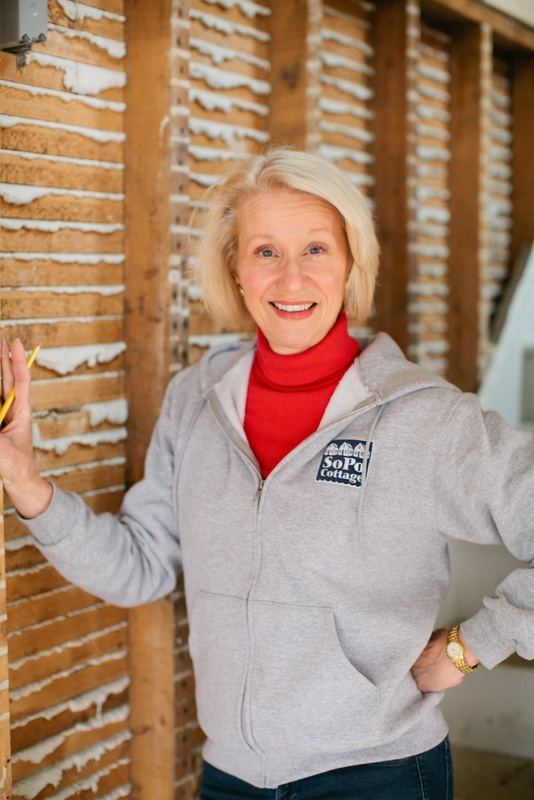 I love when you incorporate a little history lesson on this blog, can't wait to see it! Love the tub. We just refinished ours, and found a 1932 date stamp on the bottom. Love the tub. We just refinished the one in our bathroom. Found a 1932 date stamp on it. Way cool!